Being a map of the head-space of Camestros Felapton based upon his voyages during the Great Puppy Kerfuffle of 2015. A key to the map is given below and version notes and previous maps are given below. Gallo FB, Irene Gallo’s Facebook Page ⚔ Irene Gallo commented on the Puppies by describing the Sad and Rabids as “extreme rightwing to neo-nazis respectively”. Making Light, Blog of Patrick and Teresa Nielsen Hayden http://nielsenhayden.com/makinglight/ – the EPH nominating reform proposal was discussed extensively at Making Light. Whatever…, Blog of John Scalzi http://whatever.scalzi.com/ blogged extensively on the Puppies. GRRM LJ, Not a Blog George RR Martin’s Live Journal http://grrm.livejournal.com/ ⚔ several posts on the Puppy campaign with several visits to the comment by Brad Torgersen. Erin, Blue Author is About to Write, Alexandra Erin’s blog http://www.alexandraerin.com/ home of some excellent Puppy parodies. Deidre Saoirse Moen, http://deirdre.net/blog/ Early post giving a guide on how to vote No Award on Puppy nominees. Amazing Stories, amazingstoriesmag.com/?s=puppy Early announcement of possible Puppy success in nominations. Early advocate of No Award and multiple Puppy related stories. File770, Mike Glyer’s blog/fanzine http://file770.com/?page_id=22881 Published daily Puppy Round-ups chronicling the kerfuffle. ⚔ Notable comments from Brad Torgersen on people who declined Puppy nominations. Flint, Eric Flint blog, http://www.ericflint.net/ Flint is a leftwing author published by Baen, critical of the WorldCon establishment but also critic of the Puppies ⚔ His analysis caused some consternation on multiple sides. Baen’s Bar, Baen’s online forum http://bar.baen.com/ probably shouldn’t be a separate island but let’s assume I was too lazy to try to circumnavigate and just thought it was an island. Sci-Phi Journal, http://www.sciphijournal.com/&nbsp; science-fiction and philosophy journal, available from Amazon and Castalia. GamerGate – A separate video game kerfuffle. Vox Day aligns himself with GamerGate. Rumours abound about possible GamerGate involvement in the nomination process but with no evidence of any significant role. John C Wright respectfully asked if L J Lamplighter’s position on the map could be altered as she is not aligned with Rabid Puppies per-se. Brad Torgersen’s surname had a typo – for which I both burn with shame and yet oddly surprised that there aren’t more. Laura Mixon has been given an island. In some ways her nominated work for this years Hugo is not Puppy related but when I started an early draft of a timeline I found that references to the significant past fandom controversy were part of the broader narrative. As she has had some books published by Tor I put her island nearish the Tor Sea. Compass rose added. The map is orientated Up and Down and This way and That way. A tank added at Marmot gulch but unfortunately it got a bit crowded and additionally Marmot Gulch sort of violated my policy of not using names given by others. The tank is better and people can apply their own semiotic approach to it. A manatee added just off shore from Monster Hunter Nation due to multiple Puppy requests. It sorts of looks a bit like a beaver or a platypus but it was the best I could do. To make room MHN was made smaller. There were multiple Rabid requests for various things in Voxpopoli. Given the tanke as well I could only really neatly do one. A skull shaped mountain replaced a regular mountain. Spooky! The Gyre of FUD is a dangerous maelstrom that wanders the Sea of Fandom and capture wary sailors in a cycle of endless discussion that seem to go nowhere. Originally it was supposed to be named after Brian Z but that would either be an unnecessary insult or an unwarranted ego boost. People may apply their own FUD source to it. Wind cherubs requested by Kurt Busiek. I totally failed at drawing a cherub blowing winds upon the Puppy lands but then I remembered my beagle heads. Now gentle beagles go off in a huff. Various re-orientations, changes to landmasses, sizes, islands etc. All excellent notions but I have to stop. Consider the inaccuracies as realistic reflection of the errors in a voyager’s map. The revised version is here. 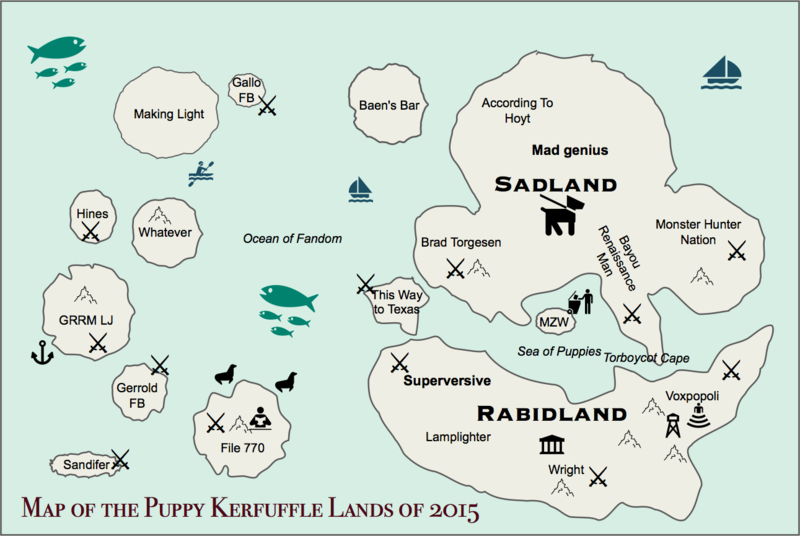 Thanks to File770 folks for suggestions and also thanks to the puppy love for the map. Maps are the ultimate political statement disguised at an attempt at objective fact – so please see this as this particular socialist’s skewed perspective (but I’ve attempted some fairness). Some have expressed concern regarding relative sizes of land – do not be misled! It is the seas that represent fandom 🙂 and we all sail upon them – or we are merpeople or maybe selkies or something. I’ve also included some sites mentioned in Sarah Hoyt’s recent account of how she saw the kerfuffle. Publishing houses appear as Greek-style temples. I’ve stuck with the crossed swords for places where significant disputes were centered or notable discussions or announcements took place. 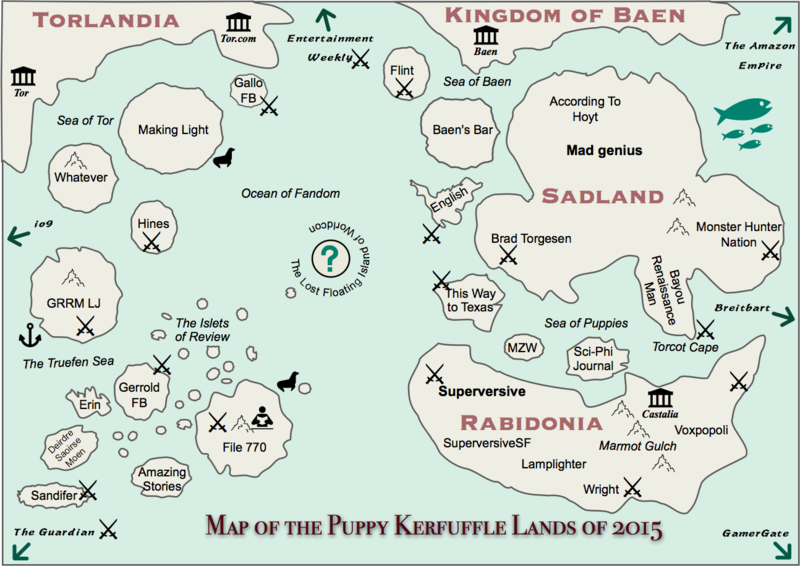 Places beyond greater fandom are marked as being off the map with green arrows. Stage 3 will be a list of links and unless I get bored Stage 4 will be an attempt at a timeline. This is a work in progress. 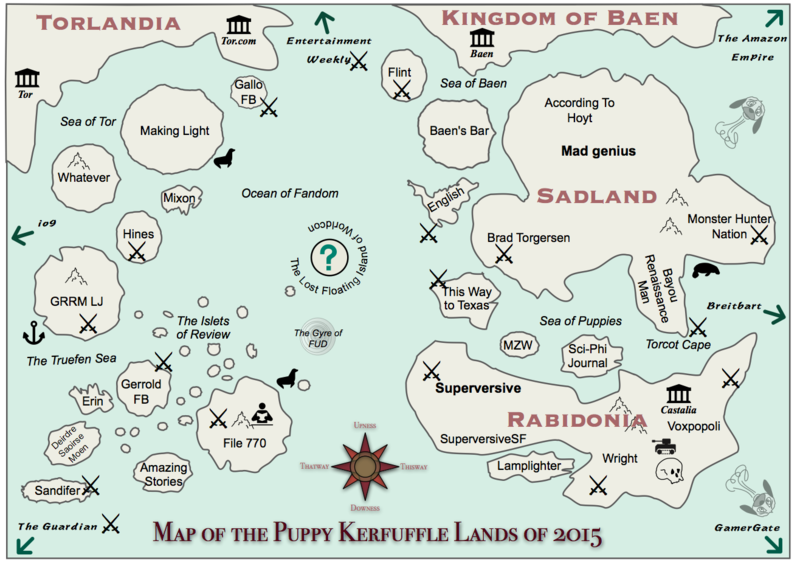 A map of the various websites and groupings involved in the on-going internet kerfuffle over the Hugo Awards. Most symbols don’t really mean anything. Groupings of bloggers under a heading in bold. Crossed swords represent places where a notable discussion/argument etc occurred. This may include Brad Torgersen explaining what he intended or some kind of deceleration of intent (e.g. a boycott) or somebody pointing out what somebody else had done.